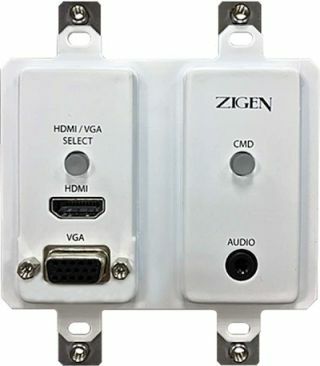 The What: The Zigen ZIG-POEWP-100 is an HDBaseT wall-plate transmitter. The What Else: The ZIG-POEWP-100 includes HDMI and VGA with audio inputs. GA can be configured as component, Y/C, or C. It offers 48V IEEE POE, remote or source. It can be set up and controlled via WebOS, or from the Zigen ZIG-POE-RXAV hand-held remote. It can be assigned simple automation, or integrated into third-party controller. It supports HDMI 2.0 with 48-bit deep color, with digital video formats up to 4K/2K 60Hz, with 4:2:0 pixel format. It supports uncompressed PCM 2- Ch., 5.1, 7.1, Dolby Digital, DTS, Dolby TrueHD, DTS HD-Master Audio, and more. It also supports IR and RS-232.